This entry was posted on November 4, 2015 at 2:04 am and is filed under Drama, War with tags 2015. You can follow any responses to this entry through the RSS 2.0 feed. You can leave a response, or trackback from your own site. Watched this last week and was really impressed by the performances. Didn’t bother me that the politically landscape wasn’t painted as the journey of this boy was the main focus. Most definitely a well made/acted film. It’s the story that was lacking. I too watched this on Netflix with an interruption. However I can’t remember if this interruption was to relieve the stress of watching a bleak story, or was for another reason. Or both. At the time of viewing I wasn’t particularly concerned by the lack of a precise political/national context. As commenter Nostra says, the where wasn’t the main focus of the story. But as you said – picking a side is usually a choice, but for Agu it wasn’t. But had we known the where and the who, Agu’s story would not have changed. I wasn’t particularly concerned with the lack of political context while watching either. But upon reflection after the film was over, I thought, well that was just a chronicle of depravation. I’ve seen that idea done before – and with more depth. 2 1/2! That’s harsh and in NY opinion certainly worth higher praise. Your points are understandable though and on any other given day, if I wasn’t ready for it I too could probably have swung left of 3 stars. But for me there was too much that I had never really seen in a film before and I found the cinematography hypnotic. When I read my review it doesn’t sound harsh, but 2 ½ stars is indeed a negative review. When people ask, “Should I see this film?” I think about my answer. 3 is still a “yes” and 2 ½ is a “no.” Since this felt more like a series of abuses to watch than a fully formed story, I couldn’t bring myself to recommend the film to people. Honestly I almost didn’t finish it, but that was more because I was watching it at home. This was a borderline torturous experience, and excellent point about the lengthy runtime too, I forgot it was closer to 2.5 hrs than to 2. In hindsight, in the same way I couldn’t imagine enduring The Passion of the Christ on the big screen, I would have been tempted to take a ‘bathroom break’ in the middle of this one. Ha! Well-acted and beautifully shot but it’s one I won’t return to. The Passion of the Christ is an interesting reference. 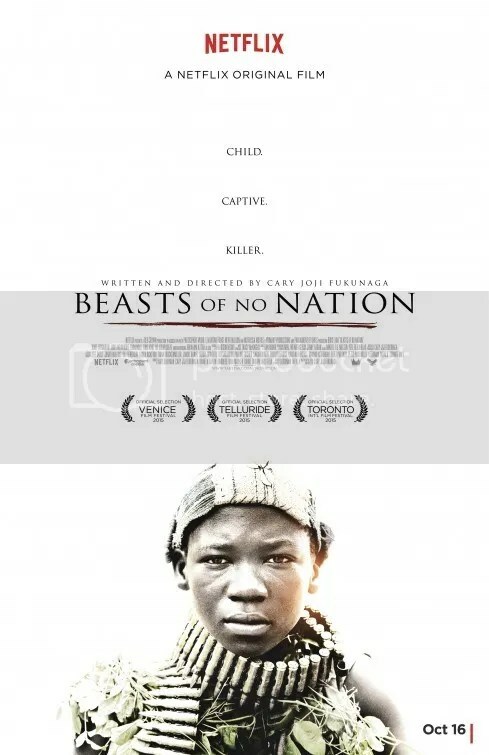 I “enjoyed” Beasts of No Nation more. I’m surprised you only gave this one a 2/4 star rating. I really, really liked this movie despite it’s content. I think Abraham Attah is a tour de force of an actor…I hope the Academy recognizes him for this performance! Loved the performances. Just not a fan of endurance tests I guess. Good review Mark. I liked this one a little bit more than you did, but I still appreciate your thoughts. Keep it up! I’d actually recommend it to some, but it’s not for everyone. Overly long and tough to watch. I don’t like the idea of kids being trained to kill. However, I thought the young boy was excellent. Idris was good too. 2 1/2 stars. Idris Elba should get his first Oscar nomination (Best Supp. Actor). I’ve heard the performances in Beasts of No Nation are compelling. Sounds like they are based on your description of Attah and Elba’s turns. I haven’t seen much from Cary Fukunaga, but I really liked his adaption of Jane Eyre and his direction on Season 1 of True Detective. I agree that the lack of political context or commentary seems like a misstep in this kind of narrative. Haven’t caught this film yet, but I will note that it took you more than one attempt at viewing and factor it into my decision on when to watch it. Also check out Sin Nombre from 2009. It’s my favorite from him.